Manly Guys Doing Manly Things » Holiday Giveaway! I am going to be away from my cintiq (and tablet) until Wednesday or Thursday and as such will be unable to get to work on a comic until at least the middle of the week. 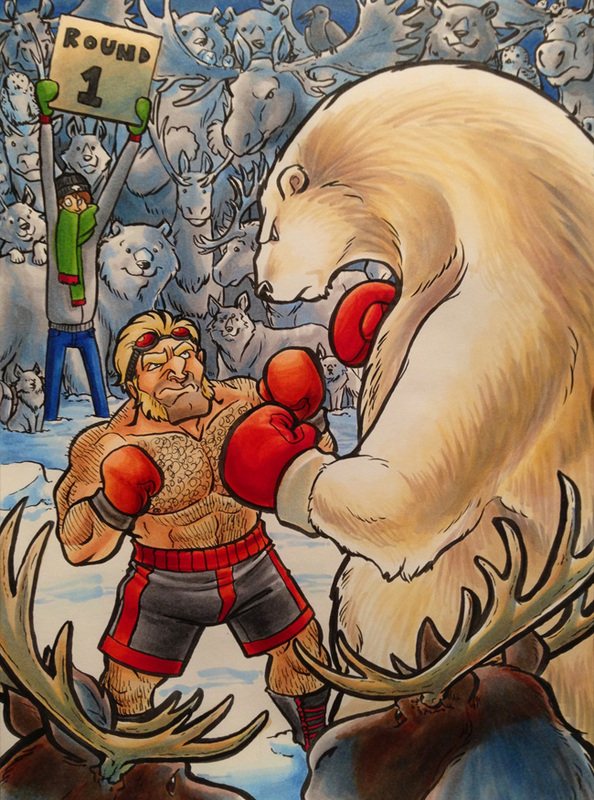 So for the sake of getting something up on-time(ish) here is an ever so wintery and festive picture of Commander boxing a polar bear lovingly traditionally rendered in copic markers on an 8.3×11.7 sheet of marker paper. And in the spirit of the season, I want to give it away! Contest is over! Congratulations to Roastsnail, who guessed 210 and came closest to the number (211)! Since I hate organizing raffles (and question their legality without proper permits anyway) leeeeeeet’s just say I’m thinking of a number between one and two thousand (whole numbers, no decimals – I know this used to say “even” but I meant that I wanted people to stop using decimals, because that would potentially draw this out to infinity. I thought I had edited the post an hour or so after making it, but apparently it didn’t go through. Sorry for any confusion) and the person who guesses closest before I get the next strip up gets the drawing. If two people are equally close I’ll give it to the first one who got it without going over. Please don’t put up more than one number once per day (it’s not fair if someone just puts up one post with a couple thousand numbers or spams the page with two thousand guesses at once). I will ship overseas! I just want to do something nice for you guys for sticking around for pretty damn close to three years and making this comic as successful as it’s been. Just make sure if you’re posting a guess you use your real email, or else I won’t be able to get in touch with you. And please don’t try to cheat, I really want to give everyone as equal an opportunity as possible! Thanks guys, and happy holidays, whatever you might be celebrating this time of year (even if it’s just a couple days off from work). A SIDE NOTE please try to avoid picking numbers other people already have. You can do a quick sweep to see if yours has already been posted by using ctrl(or command on Macs)+f to search the text on most browsers. This’ll go a whole lot faster if people stop guessing 42, 1337, and 666 over and over again. Repping California in the 818! I’m trying to vote for the number 12, but it seems there are 1662 results for “12”, so I’m just going to hope to what ever deity is watching over me that no one else voted for 12 (TWELVE). Come on, psychic powers… Ohm… 1537. I doubt I’ll win, but hey, why not try? I mostly want this because I want to study the way Coelasquid did it. I own some Copics, and I am having trouble with them. Perhaps a tutorial on using Copics is in order? Thanks for all of your hard work on this excellent comic! Happy Holidays and enjoy your time off! I choose the number 2. 42, the answer to all questions. 1903: the year humans took flight. 773 – I don’t expect to win, but why not try? :) What a fabulous piece of artwork. My money is on the Commander all the way. Sorry Bear. I have not words enough to say how much I want this so 444. This is an amazing use of Copic markers; well done. Fantastic piece! Hope I win > u< 1038? Oh boy, I’m picking 1483. What can I say? I’m a nut for Hastings. It’s also a band name. The temple Honno-ji in Kyoto. Nobunaga Oda, betrayed by his retainer Mitsuhide Akechi, vanished forever in a sea of flame. -Going for a literature reference. The shading on that boxing polar bear is impressive as hell. It’s really cool to see you work with traditional media! 42. Also my money is in the commander in this fight. Just want to note, mine was the first 42. Since Marty beat me to it, Bob, I’d like to bid 2 (dollars). I shall go Wiiiiiiiith! 17. It’s worth a shot for something so wonderful. I’m just gonna say whole numbers and no decimals so this doesn’t get out of hand. That’s an amazing painting! I’m not gonna even bother guessing. 628. Thanks for doing something this awesome! Let’s go with the lucky slot numbers of 777. And Merry Christmas to all of you! I’ll guess on the high end, 1982! Awesome art, so let’s try 479. Merry Christmas! Hope you have a wonderful holiday and thank you for keeping up the gorgeous comics. As for numbers I’m going to gueeess.. 810. Oh, and merry Christmas too! By my opinion, that picture is made of awesome! My bets on Commander! XD Booyah!! The coloring came out really nice. My money’s on the bear going down in round three from a headbutt. I will guess 1777, because it has lots of sevens in it. And you may appreciate us sticking around for three years, but I can say without reservation that it’s been a joy, and that I hope to have that joy for years to come. Merry Christmas! What a fantastic piece of art you have done, Coelasquid. Like always. Thanks for the giveaway and for all the great comics! :) I pick 748. That probably means someone took that number already. I’ve loved this comic, thank you for making it for these three years. Commander is definitely gonna win that fight. It’s not even close. i’m guessing 1536. because that’s the size of my pagefile. I’d have to say 1374. Gonna lowball with 256. Yeeeaaahhhh binary! I want that picture so badly. Didn’t notice it had to be even. I was thrown off by that, too, but I think she just wants to avoid weird decimal or fractional numbers. Eh why not, let’s give it a shot…1555. Also love this week’s picture, copic markers for the win :D.
1122, and good luck to everyone! I’m gonna go with 1721. A nice prime number. God, I can’t believe it’s been that long, I remember my friend recommending me this comic back in 2010, it seems only yesterday that I first started reading this. odd, I have to add text for it to allow me to enter mine. It’s as good a guess as any, so I like it. Commander on Polar Bear Action is just as wonderful as we could ever dream. It’s a slim chance but..
And for a number, I’ll say 942. Come on lucky 13. Historically been good to me. Merry Christmas! Love your work! I am mesmerized by that polar bear’s coat, gorgeous coloring job. Love the look of the copics! I’m always so jealous of amazing marker work. 756 I hope it’s that! 82, although I’m pretty sure you hid the number in the image somewhere! Gonna have to go with 500. 666, oh, how I love that number! Happy Santa Day Squid, thanks for the comics! Is it too much to ask that this be signed as well? Would be cool to frame it. Thank you so much for all your hard work. I hope you have a wonderful holiday! So hairy and detailed…the polar bear is too! I’m gonna go with 616, because I’ve been told that’a the actual number of the beast. The bear’s got a pretty determined look. I’d take the long-shot bet. Ill pick an important number to me! 1120. 1986. The year I was born, lol. It’s been a great three years, Thank YOU for brightening up my week ever since! Gahhhhh! number 21! Goodness I’m not good at this stuff haha XD! Ha, this is so awesome! 456. Hope the holiday season is treating you well. Your number is not found. problems, but a breach aint one. I’m going with the number 1129. Man that’s a cool picture. Damn, both my first choice and my backup got taken, curse my lateness. Guess I’ll go for the median. 1742 Even leaves out a lot of favourite numbers. That polar bear looks intense! Otherwise, thanks again for yet another year of quality comics. I looked through all to make sure and didn’t see it so 1345. Love the comic! Been following it for a while. This is my first time commenting though. Good luck everyone and Happy Holidays! Haha, that’s an awesome picture. 1324. Also, I love this comic in general and this page in specific. Possibly my favourite web comic, or pretty nearly. 717. Worth a shot, eh? Here’s hoping for luck… 904! C’mon 904! 234 probably won’t win, but why not! Straight up 25. Because Christmas. Also, I love this comic, so keep it up! I’m gonna go with the dimensions of the paper for this. My guess is 8.3×11.7 = 97.11. One thousand, four hundred and seventy three. Spelled out to make it more literary. Awesome job btw, truly a masterpiece to have in the living room. Seriously, I’d hang it in the living room. I’ll shoot for 1338. Why not? 1554! Who knows maybe you like that beer too! Love your comics! 56! 56! Why you no good 56in’… Now I can’t stop thinking about it! Also, guys: stop guessing 42, 1064, and 1. Those have already been guessed. Hmmm, ok! I choose 956! I also put 20 on the Commander. Sorry, no one’s gonna bet against you. We all know he will win. It’s only a polar bear, not a giant super mecha polar bear of doom. On second thought, CB would beat that too. 442. It’s got a real Golden Compass feel to it. Nice of the bear to use gloves. I was already having an awesome Christmas, but this picture just added another level of greatness to the day. 1369 Ooooo, please let it be me! 423……. i hope i win! Want Want Want Want! Just a warning, though: llepsgnilaeh, someone chose 1 before you, so you can’t possibly win. Davis, joaograms, Saryuko, DrWhoCares, YourOnlyAngel, Regular Polyhedra: same goes for you, someone picked 42 before you. To be fair, it’s pretty hard to look for “1”. 1692? I’m probably late, aren’t I? I also put 20 bucks on the Commander winning by KO in the 2nd round. Gonna go with the dice… 794. That’s an awfully large bear, but I am sure Commander will assert dominance in the end. I just need to command+f search the text for the correct number every few hours. Ah. That… is remarkably simple. Plus I just realized someone already put 1800… so Let’s say my guess is 1801 instead. Love the comic, hope you have a brilliant Christmas! Uh, let’s see- someone’s taken 1224 (several someones- I guess it was an obvious number), and 217 isn’t even so…1722? Oh also, Merry Christmas, and thanks for making such an awesome comic! 1378 and thanks for the opportunity! (582!) Five Hundred Eighty two! I can’t even begin to tell you how much I want to have this. 510. Thank you for taking the time to maintain this comic, I love it! Cheers from France :) 0324 is my guess ! How about, uh…367! This drawing is really beautiful, the coloring is kinda knocking my socks off right now. 92 or in case someone already has this one 29.
great now I gotta find out who on earth that person was. damn curiosity. Surprised nobody’s done 77 yet. Their loss, my pick. 965 ♥ Happy Holidays lovely. 1990 c’mon year of my birth! Merry Christmas to you and your great comic! So many numbers! I am amused (easily amused too) at all the repeats. 1337, 42, 1 are enormously popular (in this manor, squire). 2010. It’s the year this comic started, and it’s the year I’ve become a silent, content fan. 64. My Dad’s age. Good luck to everyone. this pic reminds me of a coke commercial. Im rooting for the bear,by web comic logic hes the underdog. Not so distrusted that a lot of folks chose it before you (see Remzar, for example). 42 Why not the answer to life? You, sir, are a legend! I guess 793. Damn! 793 was taken and I didn’t even notice. Er, can I change to 783? 526. I really hope no one already guessed that one. and tell you that I have enjoyed your comic immensely and will be an avid reader for as long as you choose to continue. Thanks for being an awesome fellow Canadian! 1404. Love the comic, would love the print! 843 is my number of choice. Coin toss says I use 1569. I was gonna say 333, but that’s been taken, so I’ll go with 334. Price is Right Strategy: Flawless. 1006. Because it hasn’t been guessed yet. Bah! Except it has, but not in easy ctrl+f findable form. Fine, 1002 then. My guess is 1822. I also want to wish Coelasquid a Happy Holiday and thank you for the great comics. 196. I got a good feeling about it. 1134 ! Merrys to you! Merry Christmas, hope you got the best gifts! Sorry, it took awhile for my comment to go through. If I can, I guess 345. The next person who doesn’t use ctrl+F (or the Mac equivalent) to see if their number is free has to fight the loser of the Commander/Polar Bear match! 487 and also that is a piece you have done. Boxing a polar bear classic! 716, why not. Also, any chance of this in wallpaper form? I would love to have the commander boxing a polar bear on my desktop. I’ll go with 1123. My money’s totally on the polar bear (at least for the first round). Merry Christmas! oop. just realised I glazed over the even number requirement soooo I’ll say 440 instead of my previous 439. I’m pretty sure she meant round numbers, not even numbers. That polar bear better be able to defeat Sheng Long to stand a chance. 637 . Oh man, this would be the most awesome thing to win ever! 1099. My money’s on Commander. Saw my previous guess was already taken. May I change it to 206? Let’s hope that’s lucky because people already took like 5 of my numbers. I’ll take 1334. Merry Christmas! 425! And a very merry Christmas! 1994 – the year I graduated. I was going to guess 1999 (Tonight we’re going to party like it’s), but someone beat me to it. Curse you! When I said even numbers I meant I wanted people to stop posting decimals and the edit I made to fix it didn’t go through, apparently. Surprisingly hard to find a number someone hadn’t guessed yet. When this hits 1000 posts, I suspect it might be impossible. Whup. Meant to say 2000 posts. I’m throwing up my guess as “1336” as it’s the number of the next strip. but that makes me wonder, are you going to be doing anything special for comic 1337? perhaps as a sweet new years thing an epic 1337 strip of epic proportions would rock. This looks like a really nice poster! My guess would have to be 1220. Merry Christmas!! It looks as though my number was posted before me and didn’t come up when i posted using the find feature. So my next guess is 1149. Crap! Can’t read! Even numbers…okay, how about 680? Even numbers mean not decimals. They can end with 1, 3, 5, 7, and 9 and still be fine. No, even numbers are numbers which end in 0,2,4,6,8. Whole numbers means not decimals. I meant whole numbers, because people were posting decimals and it was going to be insane trying to sift through these if that caught on. I edited the post pretty soon after making it, but apparently I navigated away from the page before it finished processing and the edit didn’t go through, I apologize for the confusion. I’m only going to guess once, so here’s my birth year. Sorry, I got it first. My comment was awaiting moderation when you posted yours because it was my first post. If you want 1993, then I’ll change mine to 1322. Otherwise you could change. Doesn’t matter. 125 is the number I choose. Still loving the Commander on my pillow case here in S. Korea so here goes!!! find functioning for single digit numbers will be a pain but I did notice “0001” was taken so not that either. manually looking through the numbers did not turn up 20. Ah. 647 sounds pretty good to me. I really like the range of tones you were able to get into this. I like the warm foreground and cooler background. Somethin’ about marker pieces, man! They’re impressive and lovely to look at all at once. This is so great. One of the only contest things I’d waste time trying to win. 555. 1651. Not sure if you are allowed to have more than one entry. If not, this entry is retracted. Not trying to break the rules, but will dance in any grey area. I am a very lazy man. Thought a series of checks and numbers I have realized that with the amount of people already in and the amount of numbers and variance of numbers this is the most likely choice for me without someone previous winning already. I am really grateful for the years already past. This comic is still truly marvelous. Thank you for drawing and posting it for us to see. 245 Will be my today’s guess :D.
That means someone else got that number first. Nah. I personally don’t see an 828 anywhere, and my post is apparently still awaiting moderation even though my number wasn’t used before, either. It’s calling out the posts as being similar, but not necessarily identical. Posts have to await moderation if the person has never commented on the site before. But yeah, I don’t see 828 anywhere else either, strange. I’m not sure what it counts as “too similar” then. I’m suspecting that it’s just automatically flagging posts as “too similar” when they only contain a 1-4 digit number after several other posts also containing a 1-4 digit number have been made. Since there’s many posts that just have a number and no text. Adding a sentence or short comment to the post seems to be all it takes to avoid running into the “too similar” issue, though. In my case (and it specifically stopped me and asked if I wanted to proceed,) both my post and another were “[Number] and happy holidays”. So that one is explainable, at least. Just thought I’d mention that it doesn’t look out just for identical posts. I got that on my post, when I just posted numbers, and since this is a number guessing to win the artwork, the spammer guessed that people were spamming. So, that is why I put my first post like I did. What an amazing picture! I’ll guess 909. My guess is on 317. Going with 226, since ctrl+f doesn’t see that yet. Keep up the awesome comic. I’m gonna guess 116, or as we cool kids call it: Elevinty-six! 1478… No I didn’t just use my PIN number… :D… This is such a great piece of work, have a great Christmas!! – 1317 – for my guess. My bet is Jared somehow ends up in the bears mouth. Oh boy. Searching for the number doesn’t work too well when it’s less than two digits. Okay, giving this one a try: 8! And I learned something new!!!!! This number speaks to me, I think. Aw, what a nice holiday idea. Thanks for sharing the manliness. Heeh, I’ll go with 1873. What the heck, it’s a wonderful piece. Any chance this will turn into a phone background? That would be really cool. Birth year is taken, so here’s birthday: 1231. A chance for few MGDMT artwork is enough to bring even my jaded heart to comment. Also, let me take this opportunity to say that I adore your comic. I was way overdue for saying that, anyway. 1052 i am surprised as to how many post odd, when he clearly said its an even number. I meant even as in not fractions, which some people were posting. I edited the post to say “whole numbers” but this connection is a little unreliable so I guess it didn’t stick. Cheers and I hope you and your kin had a wonderful holiday. 1974. Because it was a good year. I’m going to guess 106! Merry Christmas, all! 1667, Gonna win me somthin? And thanks for 3 years of manly men. 1224! can i take back 1356? Hope you had a merry Christmas, Coelasquid! even numbers as in the number you have in mind won’t be odd? I’ve been reading this comic for at least a year now, but I never knew that your hand drawn pictures were so amazing. The coloring on that polar bear is fantastic!!! So awesome. Whatever the result the next comic needs, at the very least, a picture in the background of the bear and the commander arm in arm smiling at each other and drinking a beer or something. 964! That bear is definitely going down. Sorry, bear. now for a ‘lucky’ number, 13. For some it is bad luck, others good luck. i hope it’s close to 1100 ! My guess will be 1309! Bear #2 in the back’s so happy. (This is such an awesome thing. Thank you so much for giving us all the chance to own such UNTOLD AWESOMENESS). 313 for me, Happy holidays all! I’ll go with lucky number 7. The odds are a longshot, but hey, that’s why it’s lucky. I tried to do a ctrl+f on ’12’. That gave me every post with ‘2012’. My official guess is 11. Take care and have a great Festivus, all. 475 – ’cause, you know, it’s been over a day since I posted. ;_; And BA is amazing so I will try again to get an awesome piece of artwork of him. Got to go with 1123. As in 1, 1, 2, 3, 5, 8, 13, 21, 34…. Wait that was taken… My bad. Can I try again with 669? 1340, just slightly past 2/3 the maximum. I choose 419. Best of luck everyone! The thrill of the guessing game – the more days we get into this, the more excited I’ll get! Sonny Chiba was in a movie called Karate Bear Fighter. I wish I was joking, but that movie’s pretty good. found 1,2,3 and 12, so I’ll go with… 4. Awesome comic and happy holidays! So it’s OK to go once a day? If not then just ignore this one–I already guessed yesterday. 1726. I love the comic. Only just discovered it but read all the back catalogue. He’s not a Machine! He’s a man! Another day, another guess… 1998! Well, I’m thinking something simple. Roll on 18! 1450? Sure, let’s go with that. Aside from being my >100 lucky number, it’s also the middle column of number pads! Also, what a fun picture, hahaha. Maybe 811 might be the winner. This is much more fun than a lottery! Thank you, merry Christmas, and a happy new year! seen it at least once, shortly after my first comment. Let’s give this a whirl. Come a day late, and all the numbers I’d have chosen are taken. Twice now I’ve gotten an error saying I can’t post because my comment is too similar to other comments with different numbers. This random rant is to ensure that it cannot flag me for spam or whatnot because it is now sufficiently different. Blabbity-blabbity-blah random noises bleep glorp plefk gabm nork zimplar fbleck. IS THAT SUFFICIENTLY DIFFERENT?! I’m not into lottery-type things, but to me it’s a celebration. Been a long ride and I’m glad it’s still going strong! Merry [December Celebration Drop-Down Menu Here]! 65! Glory to the sixty-five toad. I would like to guess 1307. I would also like to thank you for all of your hard work. This is one of my favorite web comics and I truly appreciate the time and effort you put into producing comics for your fans every week. Thank you so much, I hope your holidays have been fantastic. Take care. Scratch that there was auto correct, I meant 1997. 1968. The year before a great year in modern history. I’m gonna take a shot in the dark here. 1157. Gahd, this would look great on the fireplace mantle. Put me down for 1770. Also, like so many others, I really appreciate the hard work you put in and how each update brightens my day. Hope your holidays were nice. Cheers. I’m torn between 12 and 69… compromise – 1269? Ctrl+F is a sneaky plan… 228 it is! I’ll take 2468 because i appreciate this raffle. aaah ignore this one i wanted to write 763 but no idea why wrote 4 .__. Because you said we could post one number per day… I pick 136. If this is not true, I stick with my previous entry of 1369. Long live the Commander and Zee Captein! Those two would make good drinking buddies. LOVE your comic a lot! By that I mean 1,437. Woops I meant 795 –_– Sorry I get 3’s and 5’s mixed up in my head. hot damn so many comments and so many numbers ..
I’ll guess 10. Seems most people are guessing high. Sweet sassy molassy I love ctrl+f. Good luck everyone, and good on you, madam, for hosting such a fine contest! No special reason, just the first number that came into my head. Happy holidays, love the pic. 922. Tough to believe it’s almost three years already. Can’t wait for three more! Let’s go with… 524! This is awesome. What an awesome poster, and contest! Thanks! Man, that picture, I want to describe it but I’d have to put a dollar in a certain jar.